Spring is here! The plants can finally bloom. It seems like spring has sprung overnight…at least here in the Northeast United States. It seemed like the cold, damp winter just would not leave, and then I woke up the other morning to a sunny 80 degrees. Since the weather had been so consistently lousy, I didn’t even bother checking the forecast the night before, so I dressed the kids for school in long sleeves and jackets. I opened the door to put them into the car and quickly realized they would need lighter clothing. So I guess (hope) the cold miserable weather is gone for the season, which means we can all spend more time outside…which means…you guessed it…wearing more sunscreen! I have previously written about how sun protection is a requirement every day, regardless of the season or how many clouds are in the sky. I also posted a very informative guest post by Jennifer Devlin about the dangers posed by the absorbing chemical sunscreen ingredients found in most sunscreen products. The information contained in that post, along with information I learned from reading Dr. Ben Johnson’s work, in addition to the EWG’s annual Sunscreen Guide convinced me that even though some of the chemical sunscreens on the market are less toxic than others, mineral or physical sunblocks are much safer and just as effective. After trying many different mineral sunblocks I finally found one that I absolutely love and am happy to endorse. It is called Green Screen Organic Sunscreen, and it is made by a company called Kabana Skin Care. First and foremost, Kabana’s products are safe (for adults, children and even BABIES), organic, natural, and cruelty free. Second, Kabana uses zinc oxide instead of titanium dioxide as their sunblock ingredient. This is very important, because even though titanium dioxide is more commonly used in commercial products and cosmetic formulations, it is not as safe as zinc. According to Kabana’s website, zinc oxide is the only FDA approved sunscreen active ingredient that is safe for use on babies under the age of 6 months, and it is a better absorber across more wavelengths than titanium dioxide which means better protection. Furthermore, zinc is a critical mineral nutrient for the human body, while titanium dioxide contains titanium, which is a toxic heavy metal that can accumulate and cause damage to the body. There is one more very scientific, yet very important reason zinc oxide is preferred over titanium dioxide. Since zinc oxide has only one oxygen atom, whereas titanium dioxide has two; it generates half the amount of free radicals. Kabana’s inactive ingredients are great too, mostly because there are so few of them (only 7 or 8, depending on the product), and they are all pronounceable and recognizable! Fancy that! All of their ingredients, as well as their safety testing reports are available on their website. Another important reason I chose Kabana is because they do not use micronized or nanoparticles. Many companies claim they use these tiny particles because they provide more even coverage and better protection against the sun’s harmful rays. However, some recent media activity has suggested that these micronized or nanoparticles get absorbed into the bloodstream via the skin and accumulate, potentially causing toxic events in the body. This topic is somewhat controversial, since there has not been enough research done on the topic. However, Kabana feels the same way about micronized and nanoparticles that they (and I) do about parabens and other chemicals…any potential risk is too much risk. It is just not worth it when safer and even more effective alternatives are available. So instead, they use slightly larger micron sized zinc oxide particles. These are large enough that they won’t pose any risk of entering into the bloodstream, yet tiny enough that they provide even, smooth coverage and solid protection. Micron sized particles have been used in products for decades and is considered safe. And did I mention that it comes tinted? One of the main reasons people shy away from physical sunblocks is because they don’t want their skin to have that chalky, white look that the mineral ingredients naturally give. Well Kabana has taken that excuse away, because they offer a tinted version of Green Screen. Yes, tinted. It is a medium flesh-toned color that blends right in with most skin tones and does not give an opaque, mask-like look. They offer a non-tinted white version as well, which in my opinion does not appear chalky at all once rubbed in…but the tinted version is AWESOME. I love it. 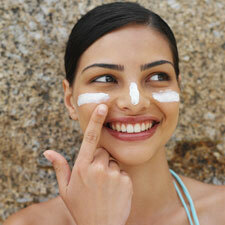 How high is the SPF? Green Screen’s original formula provides an SPF 20 uva/uvb protection, and the tinted version provides an SPF of 22. Higher SPFs are not recommended, because adding more of the sunscreen/sunblock ingredient does not significantly increase the amount of actual protection. All it does is add more of the ingredient, which in some instances can be toxic. Because of this fact, the American Academy of Dermatology recommends you use a lower SPF (15 to 20 is fine) and reapply about every two hours; or right after getting out of the pool, or sweating and toweling off after your workout. 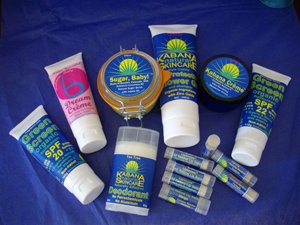 In addition to the fabulous Green Screen sunscreens, Kabana makes many other safe, natural, and affordable products that are free of petrochemicals and other harmful ingredients. They offer an aluminum-free deodorant, edible sugar scrub, all natural flavored lip balms, a diaper rash treatment for babies, a moisturizing crème, UV protective shower gel and bar soap, and money saving bundles and gift sets. It’s now the time of year to stock up on sunscreen and it’s always a good time to try out some new natural products. I’m proud to be affiliated with the entire Kabana Skin Care product line, and I think you will love it as much as I do. You can reach Kabana’s site and buy their products by clicking on the Kabana banner from any page of the Holistically Haute™ site. Go ahead, give them a try…you will be glad you did!